The literature by women writers in German-speaking countries is abundant and varied, yet it is almost undocumented in English. 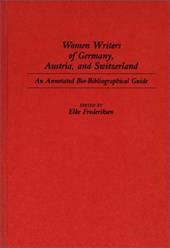 This annotated bio-bibliographical guide presents both factual and interpretive information on 185 Austrian, German (German Democratic Republic and Federal Republic of Germany after 1945), and Swiss women writers from the tenth century to the present. It is the largest collective research project on German-speaking women writers in English to date and among the most comprehensive in any language, including German. The volume concentrates on those authors who wrote and published primarily prose works, including those poets and dramatists who wrote prose. An important aspect of the volume is its inclusion of the so-called non-traditional genres, such as autobiographies, diaries, letters, travelogues, polemics, and essays--forms of writing that play such an important role in the literature by women and that provide particularly valuable insights into their social context. The selections are necessarily subjective, based on the contributors' critical perspectives and areas of interest, taking into account the development and the results of feminist literary criticism and scholarship in the last fifteen years. All entries are listed in alphabetical order in the main bibliography. The appendixes provide alternative means of access. A chronological list of authors by birthdate allows for a chronological reading of the author entries and should be helpful to readers interested in questions about a female literary continuum. The Classified List of Authors by Country will be useful to those interested primarily in any one of the German-speaking countries. Two title indexes list all titles mentioned in the volume in either German or in English translation. The list of selected secondary literature mentions all bibliographies and reference works used for the compilation of authors. It also includes theoretical and critical studies, works on women in the cultural context, and works on specific literary topics. Each author entry begins with the name of the author by which she is best known. A paragraph follows the author entry providing brief information on the author's life and her cultural and literary context. The paragraphs following the general description contain detailed bibliographical information for all listings. Annotations are provided for selected individual works. The volume will be of interest to anyone interested in the writings of women authors from Germany (the two Germanies after 1945), Austria, and Switzerland and it is a necessity for courses in Women's Studies and in German Literature.